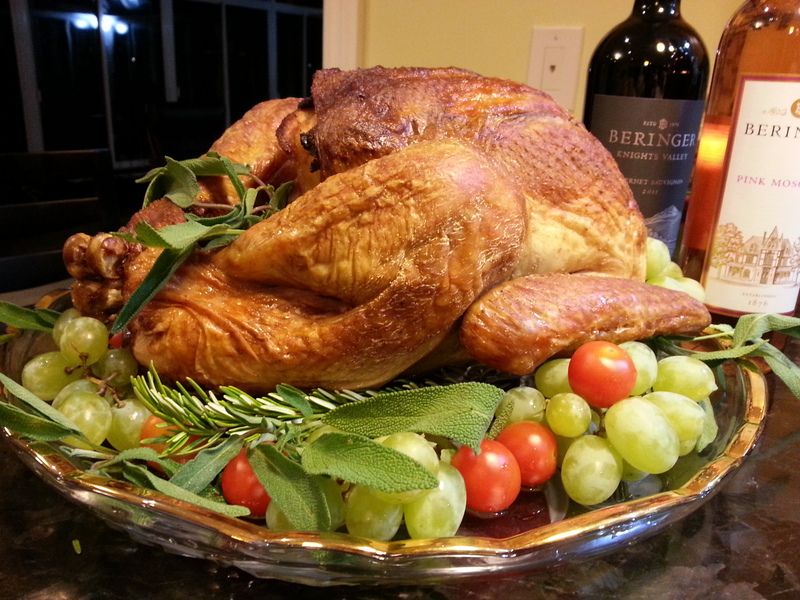 The first time I roasted a bird was last Thanksgiving 2013; roasted a 12 lb turkey for a gourmet club event with the theme Fusion Thanksgiving. Since then, my roasting pan has been sitting in the garage. The girls asked me if I will ever use that roasting pan again? I decided that I will practice roasting a bird at least once a year. So here it is: Five Spice Roast Chicken. It is moist and juicy and has a unique aroma of five spice, sage, and rosemary. Truly Fusion. Wash and pat dry chicken the night before roasting, set on a wire rack. Place bacon and ginger under the skin on the breast side. Brush marinade generously on skin and inside chicken, leave aside for half an hour. Save the leftover marinade. It can be boiled and used as dipping sauce for the chicken or roasted vegetables. Rub four seasons powder on the skin and inside the chicken. Wrap chicken and store in the refrigerator until ready to roast the next day. 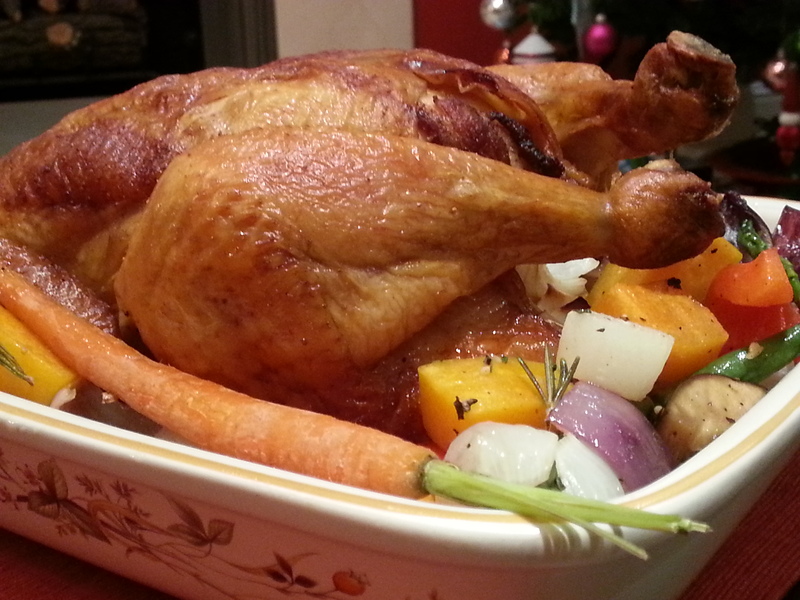 4 hours before roasting, take chicken out of the refrigerator and let it sit on the counter for 2 hours. Preheat oven on Convection Roast @ 425 degree F.
Stuff chicken with cubed onion, sage, and rosemary, and place chicken on a rack in the roasting pan. Roast chicken at 425 degree F convection roast for 20 minutes, breast side up. Reduce the temperature to 375 degree F, roast for another hour until meat probe on the thickest part of meat reads 165 degree F. When checking the temperature, remove the roasting pan from the oven and close the oven door to maintain the temperature of the oven. Let chicken rest for 20 min. Save the chicken drippings for gravy and chicken fat for cooking other side dishes. Note: Substitute turkey with chicken if roasting turkey instead. Five of us ate the entire 5 lb chicken over two dinners, one lunch, and there is still left over for chicken fried rice. We will only roast turkey if there are enough mouths to eat a 10 lb bird.